Item is a composite photograph of the 1924 sophomore class of Dalhousie Arts and Science. 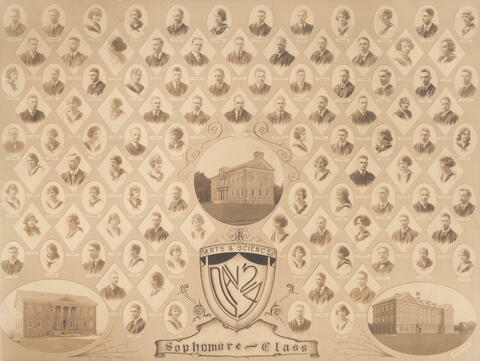 The photograph consists of portraits of S. B. Profitt; C. R. Sutherland; E. F. Rogers; M. MacCalder; H. A. Frame; C. E. Parker; T. A. Robertson; C. Coffin; L. J. Byalin; E. M. Black; A. F. MacDonald; G. E. Mills; Donald McInnes; Younghill Kang; E. E. MacKay; W. G. Ray; H. H. Nye; J. A. Taylor; R. M. Williams; J. E. Morrison; A. D. MacKinnon; A. D. Duchemin; M. MacLeod; M. Archibald; A. I. Mader; J. W. Sutherland; E. R. Leslie; J. L. Nickerson; E. A. Bayer; W. C. MacInnes; T. M. MacDonald; G. H. Pringle; R. F. Ross; R. C. Robb; W. R. Elliot; F. W. M. Bissett; E. M. Jones; R. Zwerling; M. B. Vail; H. Hamilton; C. F. Campbell; R. G. Johnstone; A. Hassan; W. A. Hewat; A. I. Murray; D. M. Clouston; P. Tupper; H. Campbell; J. A. Shaw; R. S. McLeod; G. Smith; H. F. Kinsman; D. MacMillan; S. MacLeod; W. C. Harrison; E. G. Pitts; M. R. Butler; J. D. N. MacDonald; M. MacKenzie; D. J. Covey; I. L. Madill; A. H. Cameron; J. MacDougall; M. E. Swetnam; M. A. MacMillan; C. E. Read; N. Spike; L. A. Rundle; A. C. Colquhoun; L. K. Proctor; W. H. Swan; R. L. Linder; J. W. Longley; J. Jamer; M. K. Campbell; D. S. Campbell; M. E. Hoben; P. M. Cassidy (Treasurer); M. E. MacKay (Vice President); P. G. Young; R. H. Norton; H. L. Wilson; M. Murray; A. G. MacKean; C. F. Murray; A. B. Morton; R. D. MacIntosh; W. M. Kirn; K. Smith; D. McCuish; M. G. Colquhoun; C. J. W. Beckwith; W. A. Richardson; B. M. Sims; M. E. King; C. H. Parks; K. M. Buttenshaw; E. M. Fox; C. S. Mosher; M. D. MacAulay; C. E. Crease (President); and M. Mader (Secretary) arranged in eleven rows around photographs of three buildings and a crest.